While there are whole lot of security cameras sprouting up on the lower end of the market, Arlo by Netgear aims to corner the higher end, more serious security conscious consumers. If you’re looking for a very high quality security camera that works outdoors and is really easy to set up, then Arlo might be the right camera for you. For this Arlo security camera review, we’re going to lay out all the features and drawbacks and compare them to other security cameras on the market today. There are very few security cameras on the market right now that can compete with the Arlo Pro system and none when it comes to cameras that are easy to install. These cameras also offer an extremely wide depth of features and have great compatibility with IFTTT software. The only thing we didn’t like about the Arlo pro is its lack of ability to record continuously. It instead uses motion detection to record rather than a stead video feed. While this does reduce files storage size dramatically and saves on battery power, the option to do it at all would be nice. To get around this the pro’s wired cousin, Arlo Q, does have the ability to record continuously. Netgear sells the Arlo Pro in a variety of different packages, including just a single camera and one base station or if you already have a base station you can get a single camera add-on. They have packages with two, three, four, and even five cameras included with a base station. Prices range anywhere from $150 to $600 depending on how many cameras you want and if you need a base station or not. Arlo Pro cameras take a base station approach to connecting them to your network. The base station connects to the cameras over Wi-Fi and then connects to your modem or router through an Ethernet cord. Many wireless smart home technologies use a base station these days because they take a lot of the strain off your router and are simply a lot easier to set up. Arlo’s base station is no exception to this reasoning. Having wireless cameras stream over your wireless network directly can put a huge strain on your network and you might experience video delays or even outages. This might require you to upgrade your entire network infrastructure just to get your cameras working. Another advantage to the Arlo Pro base station is having the ability to back up your video footage. You can simply plug in a USB drive to your base station and transfer all of the video over to the flash drive. The Arlo app will also detect if your USB storage drive is getting low on storage and start automatically overwriting your oldest video files, so you always have the latest video backed up. The Arlo Pro cameras are just 3 inches long and tall and only two inches wide making them extremely compact and easy to place anywhere. They also have a sleek ovoid shape that looks straight out of a cool science fiction movie. Since they are so small, they are pretty easy to hide from sight which can be extremely important when it comes to home security. There are tons of mounting options you can get from third party vendors, but each camera comes with a round magnetic mount that you screw into the wall giving out a really easy mounting option right out of the box. Arlo Pro records in 720p resolution and has a 130-degree wide-angle lens with very high quality video. The infrared LED can record video in an almost lightless room, however as you can see in this sample video, extremely low light can produce a little fading in the edges of the video. The microphone also records in very good quality, and the built in speakers are plenty loud in most situations. Playing back video in the cloud storage is very simple and has a lot of great features. Each video is displayed with a thumbnail and date so it’s very easy to find the footage you are looking for. It’s also easy to access the live video footage using their mobile app or if you prefer, on their web portal. Even the smart home features with Samsung SmartThings and IFTTT work flawlessly. An example of usage might be having a set of smart lights turn on when the camera detects motion. 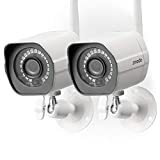 If you’re interested in connecting your security cameras with a home security system get a free quote with Protect America. Be sure to ask them about their Arlo Pro camera deals! You could save up to $100.